Tread Lightly! is the newest member of the American Quarter Horse Association Alliance Partnership program. Tread Lightly! promotes responsible outdoor recreation through ethics education and stewardship. AQHA and Tread Lightly! value open access to beautiful, healthy public lands for recreational use. With increased popularity of outdoor recreation and limited open space, conflicts between enthusiasts enjoying different modes of transportation, such as horses, mountain bikes and motorized vehicles, is on the rise making for a greater need for education and outreach about responsible trail use. Tread Lightly! is working to help prevent or reduce trail closures resulting from environmental impacts and social conflict by providing a series of educational brochures. The pamphlets are full of tips advocating an ethic of stewardship and promoting a wide variety of recreational activities. 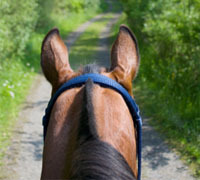 Some of the tips also include information for responsible horseback riding. 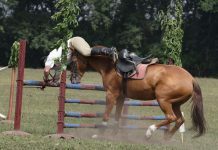 In addition, the brochures include a series relating to activities involving the use of motorized vehicles that provide guidelines such as what to do when approaching horses or other pack animals. AQHA is facilitating Stewards for Trails, Education and Partnerships (STEP), a new program that helps educate equestrians to become effective advocates for trail stewardship in the horse community. Formerly known as Trail Trotters, the program was launched in November 2004 by the Equestrian Land Conservation Resource in partnership with the National Forest Foundation. The goal of STEP is to increase participation in trail stewardship among equine enthusiasts while casting a positive light on horseback riders to land managers and other trail users. To learn more about the new STEP program, visit ridegreen.aqha.com. Great programme. And I love the photo too.